Please Click here to submit an inquiry about this item. 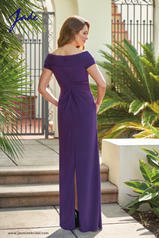 Pretty matte jersey (with stretch lining) Mother of the Bride dress with a pretty portrait neckline. Detailed gathers on the beaded bodice and layered skirt. Slit on the back of the skirt to complete the look. Proudly serving the St. Louis region for over 34 years. Come and visit our award winning shop in St. Louis. Appointments are always recommended for your convenience but appointments are only necessary on Saturday.